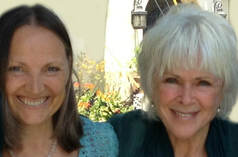 For all those who have participated in the Introduction to The Work of Byron Katie or who have already practiced The Work. Once you have understood and experienced the tremendous benefits of The Work, it is time to make The Work a regular practice. For this reason, Sylvia Dreiser Farnsworth, Certified Facilitator of The Work of Byron Katie, has created this platform were we can practice The Work together. Feel supported through a regularly practice. Find answers to questions that come up when doing The Work. Get established in the usage of this amazing tool. Sharing insights, experiences, victories with each other. Join from anywhere - our meetings are ONLINE. ​You don't need to be tech savvy. Sylvia will send you an email with all instruction. You can join the class from you PC, Mac, tablet or via phone. Cycles of two months: Meeting twice a month. Length of meeting: 90 minutes. Write me an email if you are interested and I'll add you to the list.